"The Immigrant Red Meat Syndrome." It follows this thinking: "I was poor were I came from and couldn't afford much meat. I am successful in America, and now I will eat lots and lots of red meat." The fact that the family business was sausage manufacturing didn't help matters. I never had my father's love of meat and after his death I easily became a vegetarian and remained one for more than a decade. Slowly, as I got into gourmet eating, pregnancy and children, I began eating more animal products, mostly fish, occasionally chicken. My kids are now tweens and are craving red meat, so now we eat that about once a week. I'm lactose intolerant, very common in Mediterraneans.. but I find as I've gotten older I really desire some dairy products. Probably because it becomes harder to absorb calcium as you age, but woman need it to prevent osteoporosis. I mostly eat yogurt and raw aged cheese which naturally has enzymes that aid in digestion, along with less lactose compared to young cheese like mozzarella and ricotta. It dawned on me that I am eating the traditional diet of my ancestors.The Mediterranean Diet is a really a simple and healthy one to follow. You eat mostly fresh fruits, vegetables and pasta. I replace regular pasta with multi-grain and/or whole wheat pasta along with whole grains like: brown rice, barley, millet, quinoa etc. Use meat as a condiment. Instead of having, for instance, a pork chop as the center of your dinner plate, use a small amount of pork, beef or chicken in a pasta or rice dish, in order to keep your serving of protein down to the recommended 4-6 ounces a day for an adult. 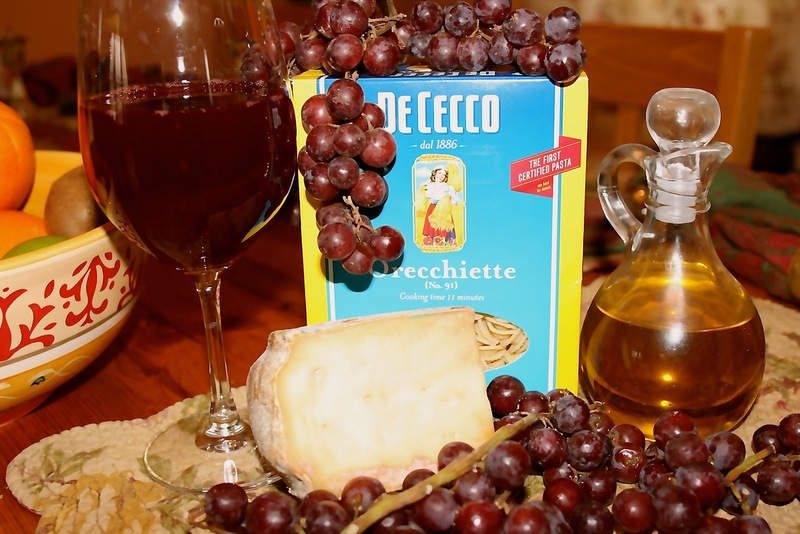 One glass of wine a day at dinner aids digestion, increases circulation, keeps fat from attaching to your arteries. If the wine is red, you get a nice dose of bioflavonoids which help prevent cancer, heart disease and stroke. Wine also helps you to relax, and transition out of your work day into your family time. When I think back to my childhood and remember the neighbors who were from Italy that maintained their traditional diets, they were amazingly fit and mentally sharp for their ages. Most lived into their 90's without taking medication. 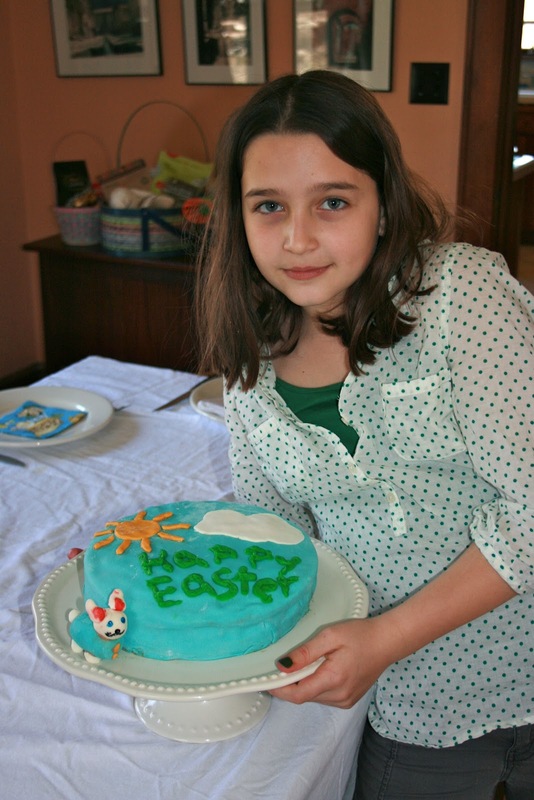 & a Fancifully Decorated Easter Cake by my 10 year old daughter. Tuesday: Thai Curry Shrimp with Brown Jasmine Rice and broccoli. Wednesday: Lentil Shepherd Pie and green salad. Friday: Frozen Trader Joe's Batter Fried Halibut, organic tater tots with roasted asparagus. Saturday: Meat Raviolis with Marinaria Sauce with a Baby Greens Salad. minus the wine for me, and it sounds like a perfect diet! I do like red meat, but it is rarely the main part of any of our dishes. Fresh fruit, veggies and pasta are our favorites over here (ok hubs is a meat guy, but he deals, lol). My grandma lived to 94, and was rarely sick until the last few years. She ate potatoes almost daily. It is so simple and amazing when you think about the people in your life who lived long and well. They ate this way. Just found your blog, through the Orgjunkie link up :) I'm a vegetarian but my family are omnivores. Meal time is wild over here lol. Maybe you can use some of my recipes. A lot of times I just pick the meat out. I like, "Use meat as a condiment." It makes such sense. I also find it easy to change meat meals into vegetarian by leaving out the meat. It is interesting, this week of Passover, we eat more meat than usual. I made delicious meals but I find, I eat only a spoonful or two. As good as it is, I seem to have little desire for meat. Sound like you are just tuned into your body. I don't really think we need much of what meat has to offer nutritionally past the age of 20. 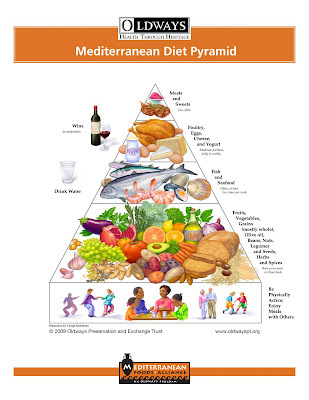 I agree that the Mediterranean diet is a great one to follow. It may even be a great transitional diet for someone who would like to be a vegetarian. Really good point, especially if the person gets used to meat as a condiment. Then it becomes something you can do without, like ketchup.